Karl Lagerfeld is a well-known genius of our time. He is the German creative director and head designer behind the luxurious brands of Chanel, Fendi as well as his eponymous fashion label. Apart from being a designer and an artist he is also a photographer. Therefore, as it is the case for many creative individuals, artists are constantly always on the move getting inspired by the works of anything and anyone. It is this perpetual encounter and drive that induces a spark in the artist so that they can later begin to create something so exceptional and magical! 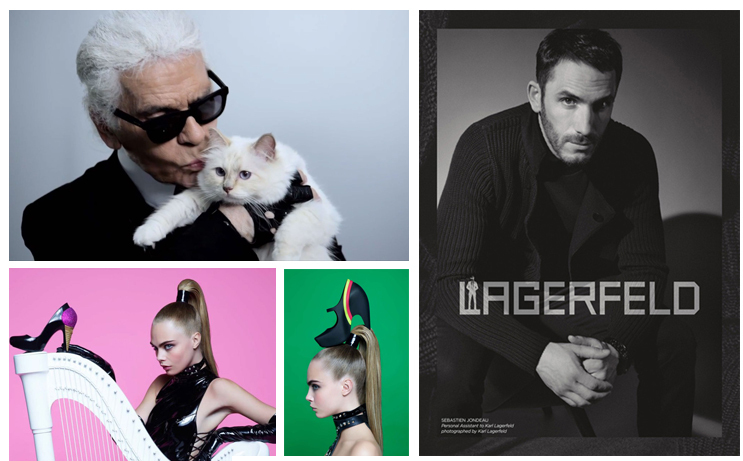 So it is to Karl – throughout his extensive career he has been inspired by great and numerous eminent figures, places and things including Cara Delevingne, Baptiste Giabiconi, Saskia de Brauw, Sebastien Jondeau, Russia, lions and even his cat, Choupette. Karl Lagerfeld referred once in an interview with Elle Magazine that Cara Delevinge in his eyes represents the “Modern It-Girl.” Karl Lagerfeld admires her strong and vibrant personality. Cara Delevinge has worked closely with Karl Lagerfeld in several modeling projects and even in one of his recent film projects. Cara was casted for Lagerfeld’s Fendi F/W 2013-14 collection film titled “Invito Pericoloso” which translates to Dangerous Invite. In this horror film she starred along with another of Karl Lagerfeld’s favorites, Saskia de Brauw, the girls were styled in Fendi fur-filled 2013-14 collection. Cara also modeled shoes for Melissa Campaign 2013, where Lagerfeld designed the shoes for the mentioned Brazilian brand. The shooting for this project went on for a whole night. Lagerfeld was captivated by Cara’s elusive and carefree attitude. He photographed Cara in several whimsical and alluring poses. Saskia de Brauw and Baptiste Giabiconi both modeled for Lagerfeld’s F/W 13 Collection Campaign. Baptiste Giabiconi has a very modern and rugged look while Saskia de Brauw looks both elegant and electrifying. This duo worked perfectly for the campaign because of their dynamic aura. Baptiste has also modeled for Lagerfeld’s Chanel Couture Fall 2012 collection which was inspired by Russian elements such as the lion. Baptiste wore a lion’s head mask during the catwalk. Another figure that has worked closely with Lagerfeld for many years is Sebastien Jondeau. Sebastien is actually his personal assistant and bodyguard as well as the new face of the Lagerfeld collection in the F/W 2013-14 campaign. In the photoshoot for this campaign, Sebastien Jondeau was photographed in dim lights sitting in a chair being portrayed as the man of the hour with a very powerful and piercing look. Lastly, there’s no telling what Lagerfeld will come up with next, just as last year for Chanel Couture Fall 2012 collection – he was inspired by no other than his cat, Choupette. He created knitted and soft cat-shaped purses, i-Pod cases and finger- less leather gloves for that collection.